As we believe, a home office should blend in with the house. Just like this one that belongs to a young couple and was designed with flexibility in mind. 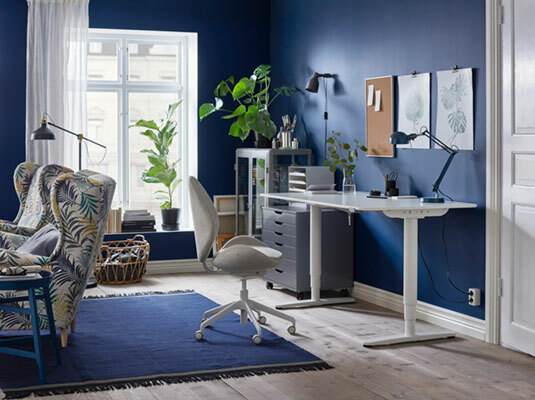 SKARSTA desks with adjustable heights, cabinets on castors, LÅNGFJÄLL swivel chairs with perfect balance, lamps in different styles, and plenty of natural light. Here’s to a productive day! One room for living, entertaining, exercising and working? Indeed. The woman who lives here is wild about a number of activities, so her home has to be nothing but functional. 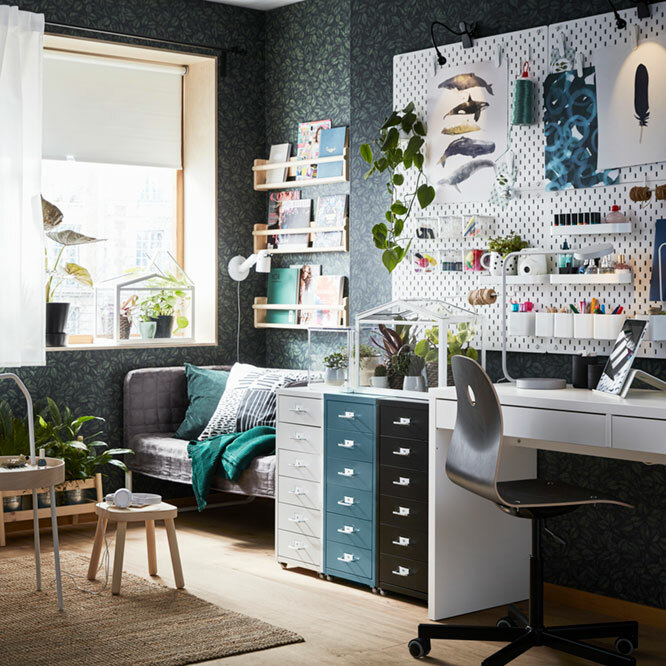 She lets all her hobbies shine in her do-it-all space featuring modern living room and home office furniture, such as ALEX desk and drawer units on castors, EKET cabinets or SKÅDIS pegboards for pictures, small things and even the yoga mat. This room can serve for both a home office for freelancers and a workspace for students. 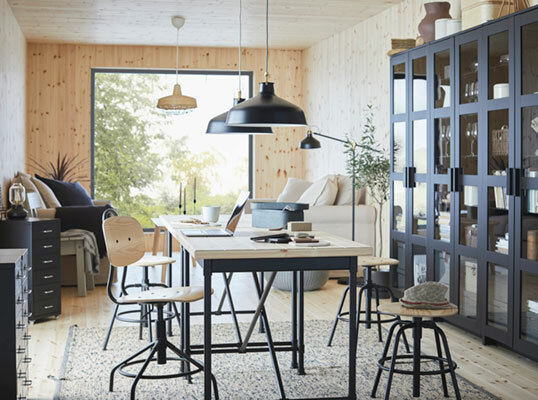 To make the workflow here easier, choose a low-price modern style office furniture, such as MICKE desks, HELMER drawer units on castors, and SKÅDIS pegboards for storage of small things. A modern home office in this couple's apartment goes together with a living room, so besides the ALEX drawer unit on castors and HATTEFJÄLL swivel chair, there also are two STRANDMON armchairs and a coffee table. Nevertheless, the most appreciated piece of furniture in this home office is a BEKANT sit/stand desk. Changing positions between sitting and standing helps you move your body so you both feel and work better. A family with teens who lives in this house has a dining table that also serves for a computer desk. The traditional interior features two industrial design KULLABERG desks, several stools and a swivel chair. The seating suits for both working at home alone or dining with the whole family. As the owner of this apartment lives alone, she can assign the whole room for her business. So welcome to her Scandinavian style psychologist's office with a cosy reception. Here, the patients are welcomed with pastel colours, a furniture made of natural wood, and white office furniture that blend in with the floor: a SKARSTA desk, some open shelves for books and papers, and a HELMER drawer unit on castors. This home office and a living room in one is a great example of how to create a stylish interior in a very small space. 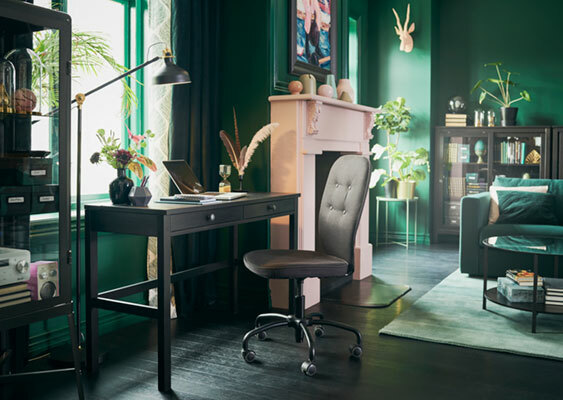 A woman who lives and works here wanted her beloved traditional style to meet modern practicality, so she chose both stylish and functional home office furniture. The INGATORP desk has a shelf under the table top to collect cables and two folding drop-leaves to adjust the table size according to needs; and the HELMER drawer unit on castors is a great match to the HEMNES glass-door cabinet. When you have only one room for both dining and working, flexible and functional home office furniture might be a clue. Take the ALVARET/ÅMLIDEN desks as an example. They are made of a lightweight material (frame in fibreboard and a recycled paper filling), so are easy to move separately or place next to each other. You can use the LEIFARNE chairs while dining or sit even more comfortable on the LÅNGFJÄLL swivel chair while working with the computer. Along the wall, there are some ALEX drawer units that can serve for either a document storage or a sideboard for serving dishes. If home is a place for growing a child, let the home grow together. This colourful children's room is both cheerful and functional. 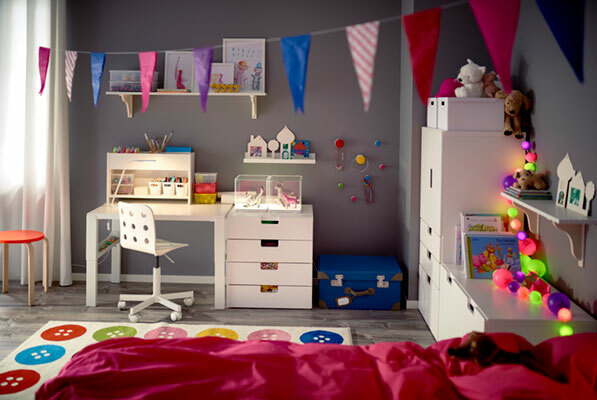 It features a wardrobe, some chests of drawers and a PÅHL desk that adjusts to three different heights, so it can be used for anything from drawing or learning to write the first letters to doing real homework later at school. The JULES children's desk chair with safety castors has a pressure-sensitive brake mechanism that keeps the chair in place when you stand up, and releases automatically when you sit down. Step into a home of two artists who feel free to combine deep dark colours with odd decorations. Their home office next to the window and a faux fireplace is well designed, just like the rest of this traditional style living room. Here, along with the elegant LILLHÖJDEN swivel chair and the FABRIKÖR glass-door cabinet, you will also find the RANARP floor/reading lamp and the HEMNES desk made of natural solid wood. A home office in this loft apartment looks clean and a bit hipster, as it features rustic industrial design furniture: the KULLABERG swivel chair together with the FJÄLLBO laptop table, and rough design shelving units made of metal and solid wood that are stable and roomy enough to hold all storage boxes, document files and even frames with paintings. Scandinavian interior in pastel colours is a great solution for anybody who wants to have a light and cosy office at home. 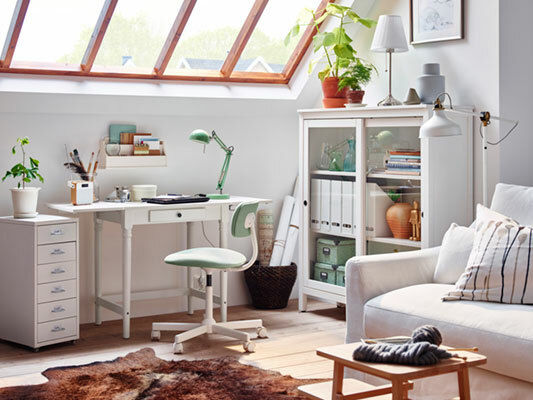 With low-price modern home office furniture, you can even set up two workspaces in one room. In front of two "twin" windows, there are two KRILLE/LINNMON desks with lockable castors, two equal table lamps, a pair of LÅNGFJÄLL swivel chairs, and a HELMER drawer unit on castors.